The Bible is the Menu, but Jesus is the Meal. Daily Spirit & Word 574: A Foreign Language Menu. Have you ever been to a restaurant where the menu is in a foreign language? You don’t want to appear ignorant or foolish, so you sit pretending to know what it means, you look at what other people are eating at the tables all around you, when the waiter comes to ask for your order, you’ll say, “I’ll have one of those please” pointing to a good looking plate of food being eaten by one of the other customers 🙂 LOL Well, I’ve not really gone that far, but I’ve felt like it. Most of the time I’ll ask the waiter to explain the menu as I can’t understand the language. 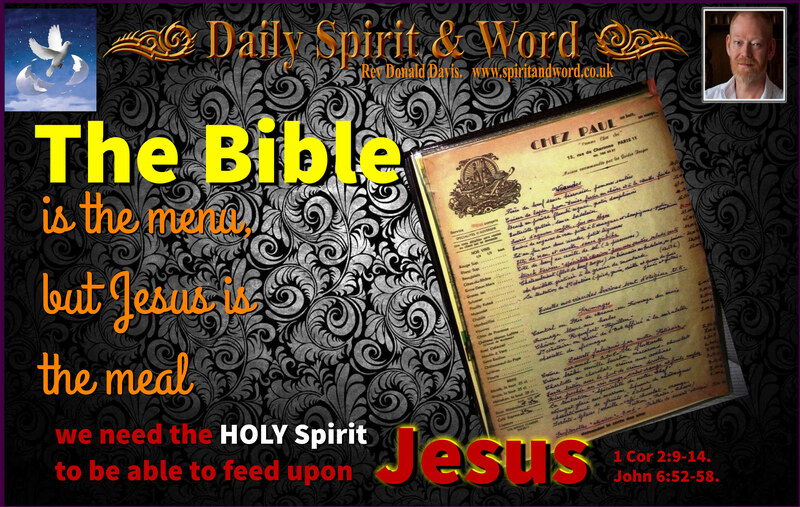 For the person without the Holy Spirit, the Bible is just like that menu. It’s written in English and on the surface can be read by anybody, and to some degree understood by most, but the ‘real’ and ‘true’ interpretation of God’s Word is by His Holy Spirit, because the things of the Spirit (which is what God’s WORD is) are foolishness to the man without the Spirit. It really is like reading a French menu when you can’t speak a word of the French language. Why? Because the Bible is written in ‘Spirit’ language that can only be fully understood by the person who’s possessed by God’s Holy Spirit. 1 Corinthians 2:9-14 “However, as it is written: “No eye has seen, no ear has heard, no mind has conceived what God has prepared for those who love him”— 10 but God has revealed it to us by his Spirit. The Spirit searches all things, even the deep things of God. 11 For who among men knows the thoughts of a man except the man’s spirit within him? In the same way no-one knows the thoughts of God except the Spirit of God. Whilst I was still quite young as a Christian I was given the privilege of hosting and leading a Home Bible Study Group, I was too young still as a Christian, because I remember getting quite upset by one individual in the group who just couldn’t grasp something that was so simple. However, I’d forgotten what it was like for myself, when I first started attending church before I was born of God’s Holy Spirit. There were things, many things, that I just couldn’t grasp and I had so many unasked and unanswered questions. Praise the LORD that He was in those early meetings and He reminded me of the grace and kindness that was afforded me from those who were mature in the faith, whenever I came out with something silly. Instead of jumping on me and correcting my errors, they’d just nod their heads and say, “That’s so interesting, I’ve never thought of it that way before”. Then when I got home and prayed, the Lord would show me the simple error from His Word, I remember being physically embarrassed by my foolishness, I went beetroot red in the face 🙂 and I was on my own, well, not quite, because the Lord was with me. So at the next Bible meeting I had to confess to the group my foolishness, they just smiled and said, “We KNEW the LORD would show you”… How did they know? They were mature, they’d prayed for me when I gone home, they’d brought my folly to the LORD and asked Him to show me the error of my ways, and guess what, HE DID. “The Man without the Spirit does not accept the things that come from the Spirit of God” And from experience I can confess that those who are young in the faith find it difficult too. Further, there are those amongst every group of Christians that remain babes in Christ, they don’t grow up or onto maturity in the Spirit. Why? There are many reasons, but the primary reasons, I believe, is because they don’t develop Spiritual Disciplines: i.e. they don’t pray every day (and I don’t mean a quick prayer on the bus on the way to work), they don’t STUDY their Bible on their own, they don’t seek out SPIRITUAL encounters, they simply attend church and get spoon-fed every Sunday, and before long they’re drifting away from the faith. Why? Because they’ve remained babes in Christ, they’re saved, but remain immature and foolish. It’s horrible, but I’ve seen countless brilliant people, very clever people from a worldly perspective, with great intellect, but who’ve wandered from the faith, because they didn’t do the basics and grow to Christian maturity. Discipleship is so important, we must remember that Jesus didn’t command us to go and make converts, but disciples. For far too long sincere Bible believing Evangelicals, Charismatics, Pentecostals and Baptists have made the mistake of getting people to make a ‘decision’ for Christ and then leaving them all on their own to work out their faith. Jesus didn’t call us to make converts, but Disciples. It’s NOT a numbers game, but a growth towards maturity campaign that He’s give us. Here’s something else: “If you are not praying daily, feeding upon God’s Word and seeking the fullness of God’s Spirit, you’ll not be growing the way God wants you to grow”. Don’t become like the Pharisees who made Scripture study a practice to gain knowledge and understanding, Christians feed upon God’s Word to EXPERIENCE Christ, not just to gain knowledge. As Jack Deer has said in his book, Surprised by the Voice of God: “The Bible is the menu and Jesus Christ is the meal” and “If our Bible study doesn’t lead us to an experience of Jesus Christ then we are like the Pharisees who were holding the menu, reading the menu and studying the menu, but they were so far from the meal” Page 175. You see my friends, the HOLY SPIRIT wants you to really experience the fullness of life today that those early believers in Jesus did. When you avail yourself of all that He’s provided for your growth towards maturity; prayer, Bible, fellowship, study, praise, adoration and evangelism, then you’ll be growing stronger in the power of the Spirit day by day. Those things that seem hard for you to fathom, difficult like fighting against a tornado today, they will become as a breeze in the Spirit. He’s going to be opening up the Bible like never before, and He’ll also be giving you Gospel opportunities that you never expected. So my friends, gather with the brothers and sisters to get into God’s Word, to worship and pray together, to sing praises to the Lord, to minister to each other and then to serve the Lord Jesus Christ in the world together. Like Barnabas and Saul, who were set-apart by the Holy Spirit: He’ll also be sending you out on His missions in the world today. My message today might be like a foreign language to you: Like a French menu when you don’t speak French. I’ve no doubt that some will be left scratching their heads, but those who’ve been born of God’s Spirit will be moved, they’ll be encouraged and if needed they’ll have been given a timely (gentle) kick-up-the-backside to get back into fellowship in a serious and committed way. Hebrews 10:23-25 “Let us hold unswervingly to the hope we profess, for he who promised is faithful. 24 And let us consider how we may spur one another on towards love and good deeds. Praise the LORD for the way He moves to get us to grow towards maturity in Christ. Remember the Bible is the Menu, but Jesus is the meal (bread of Heaven) and we feed upon Him by the Holy Spirit that He gave to us. Follow the menu, the Bible is the Christian menu, but we need to learn it’s language, the language of the Holy Spirit to be able to eat the meal contained within, but always remember that Jesus is the meal, so don’t be like the Pharisees who were so close, they had the menu in their hands yet remained so far away from the delights and treats contained within. Amen! Previous PostPrevious The Chains Fell Off.